I presented a lot this past Spring. And when I say a lot, I mean three conference presentations in four weeks. The weekend following the third of the three conferences, I went to Indiana to be in my friend's wedding. I managed to drive for one of the conferences since it was just up in Massachusetts, but I still ended up flying more in the space of five weeks than I had in the three years prior. This gave me multiple opportunities to experience airports in close proximity, and there's something I noticed this time that never quite stuck out to me before. The thing that stood out? The fact the board just outside my arrival gate always had information about the gates for the connecting flights of the people on that plane. Sure, all the flights that are coming into and leaving from an airport have their times and gates and everything else listed on the big boards along the corridors of the airport, but the board beside your gate is just your connecting flights. 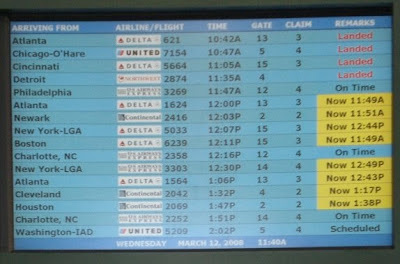 It's not like that particular board specifically says, "Jessica Olin, connecting to BWI, go to gate B24," but it's clear that they have a way to see who on an incoming flight is making a connection and automatically updating the board beside the gate to reflect those individuals. What about the uncommon connections that we help our patrons make when we talk to them in person? An example of this is the time I realized the person who was looking for the New York Time Index was really looking for the text of a speech that Bill Clinton gave when he was running for president. Since the kind of connections we, as librarians, make aren't as uniform in nature as connecting flights, am I just getting lost in a flight of fancy? It's been a while since I've left you with more questions than answers, but there you are. I'd really love to hear what you all think about this? Should I even keep playing with the idea? You're not alone in this though, Jessica. But the issue we run into has to do with the stand libraries have taken regarding patron privacy. So it becomes a question of how can I provide more information that would be useful to you without really knowing who you are? Unless their is a way for patrons to opt-in to data collection, yet still be able to keep their data anonymous, I'm at a loss of how to proceed. Would love to hear more from you as the thought develops.